The most significant aspect of low income households is how much cash flows through their hands. 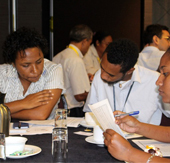 The PNG Diaries was a longitudinal study carried out by Pacific Financial Inclusion Programme (PFIP), the Bank of Papua New Guinea, and Microfinance Opportunities (MFO). Data recorded related to the inflows, outflows and events of people’s lives, in other words information on the people or organizations to/from which respondents give/receive. As the first study of its kind in the Asia Pacific region, the PNG Financial Diaries provides a unique, comprehensive view of livelihoods and transactions of respondents, collected through weekly interviews with an estimated 264 households over 44 weeks within three research sites (Goroka, Kimbe including Hoskins, and Port Morseby including the LNG plant at Lea Lea). The PNG Diaries Final Findings were presented to key stakeholders and a broad cross section of industry through a Financial Service Providers Workshop on November 19th, and a Policy and Practitioners Briefing on November 20th. The analysis covered: transfers including intra-household or intra-family transfers, direct deposits, loans, savings, insurance and remittances. In addition, the in-depth interview data revealed deeper insights as to the ways in which respondents engage with barter, cash gifts, trade stores, agent and Wantok networks. “Increased financial inclusion, financial security and financial wellbeing will only improve as key information gaps are identified and explored, so that data informs, facilitates and drives the development of responsive financial inclusion policies, partnerships and ecosystems delivering products and services to the 80+% un/derbanked across PNG. This was the key message conveyed consistently across the two days from the Bank of PNG Deputy Governor Mr Benny Popoitai, Bank of PNG Assistant Governor Mrs Elizabeth Genia, UN Resident Coordinator and UNDP Resident Representative Mr David McLachlan Karr, PFIP Regional Financial Capacity Advisor Mr Jeff Liew, Centre for Excellence in Financial Inclusion Senior Technical Lead Mr Ross Croulet, New Zealand High Commission Development Council Mr Jonathon Fletcher and echoed by all Financial Service Providers including but not limited to Westpac, ANZ, Bank of the Pacific, Nationwide Microbank, Asian Development Bank, Teachers Savings & Loan Society, PNG Women in Business Microfinance, International Finance Corporation.